This is a slightly edited and illustrated version of a piece I posted to the USENET news groups misc.transport.rail.australia-nz and aus.rail on the morning of the 31st of May, 1997, shortly after my girlfriend Jenny and I had watched the unloading of the first of Sydney's new trams. Jenny corrected all my usual grammatical and spelling errors and reminded me of certain items. The article was a collaborative effort, even if it's written from my point of view. Sorry about the load time for the pictures, ive asked the browser to scale the full size images on the fly. Does mean however that it will be quick to load the full size version !. They made it this time !. As I type this, railcar 2103 will be being prepared for its first powered run in Sydney. Jenny and I arrived shortly before 3am to find a small number of photographers, a semi, and a crane unloading the ramp off the back of the semi. As we arrived, so did a number of SLR executives and their publicist, who quickly determined who were fans and who were from the various media organisations. While newspaper photographers are probably hard to separate from the rest, there were a number of professional betacam video camera wielding photographers, one camera clearly displaying channel 7's logo. So look for coverage of the unloading on both the TV and in the print media. The railcar made its first run at 2:40pm that afternoon with the media and a number of fans watching. Networks 7, 9 and the ABC all had footage of the rollout. Network 10 ignored the entire affair. It was not immediately obvious which of the light rail people were management and which were technical staff. All were dressed in warm casual clothes, with some carrying cameras. They all seemed to be on friendly terms, and clearly very pleased to have their tram safely unloaded on a Sydney street. While backing down Hay St, a Taxi thought he could pass the truck but they rapidly threw the car into reverse after noticing that the trailer's rear axles blocked the entire road (and got an earful from the truck driver!). The taxi disappeared before one of the Police officers watching the proceedings managed to intervene. The Unimog road/rail truck had a little trouble lining up with the ramp and when its wheels finally lined up, the first part of the ramp (the final wedge to rail level) broke. They placed two brake disks under that and eventually the unimog made it up the ramp. Meanwhile teams of guys were removing the chains that held the LRV to the truck and unbolting the chain mounting plates from the underside of the LRV. At this stage someone edged up the tarp at the front revealing the car's road number of 2103. Then the wraps came off - someone climbed onto the roof and started rolling the two tarps, revealing the entire car - under the two tarps the entire tram was wrapped in bubble-wrap packaging! This was soon dispensed with, while a technician boarded the tram and turned the marker lights on. As the visiting media were getting their shots, the technician rolled the destination blind around from being blank to read 'Central Station'. Somewhat unusually in this age of dot-matrix displays, the LRV's destination indicator is a traditional scroll. At around 5am, after fiddling with the railcar's brakes (they appeared to be having trouble getting them to release), the last of the chocks was removed and the unimog truck slowly started to tow the car down the ramp. 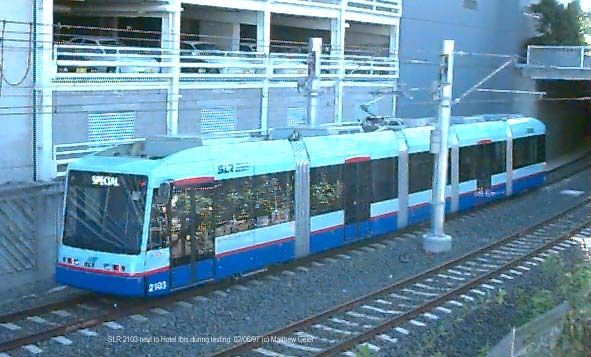 According to my digital camera the LRV touched the rails at around 5:30, much to the relief of the Light Rail staff. The publicist immediately got on her mobile phone to spread the good news! Soon they had the internal lights powered up and the SLR people all piled in to their new tram for some 'family' photos. The unimog was then uncoupled and 'ran around' and coupled to the 'Sydney end' and after a short while, the Unimog propelled the LRV towards and over Darling Drive , the railcar making its first Sydney road crossing shortly after 6am. The tram signals didn't activate - they were running 'wrong road' so I assume that is why the lights didn't change - they propelled the LRV over against the traffic signals! The Unimog then uncoupled and shot off up to the depot where it got back on to the rails and backed down the track to the Powerhouse Museum and coupled up to the 'front' again. The pair passed the Exhibition station at 6:50am, and after another runaround in the depot yard, the Unimog pushed the railcar into the shed just after 7:30am. I assume today will be spent readying the railcar - the bogie skirts were in the car, not on the outside. There were wood blocks in the bogies' suspension, locking both the primary and secondary suspensions. Various electrical cable fittings on the roof appeared to be still taped up with some sort of gaffer tape, and the pantograph was tied down with two cable ties. While waiting, the publicist told us they now expect to start running public services 'late July' and it sounds like they may start services with less than the full fleet available. Railcar number 1 will apparently now be the last into Sydney, as the damage to it was reasonably serious and Adtrans will repair it after they have finished all the other cars. The pictures currently at http://www.law.usyd.edu.au/~matthew/railway/slr/images/unloading were mostly taken with a QuickTake 150 digital camera, whose low light capability is next to nonexistent. I got far better results with my Canon T70 35mm , the scans of those pictures being the larger image files you find and the ones used to illustrate this article. I didn't use any special film or equipment. The film was Kodak Gold 400 print film and the camera was left in automatic. There was enough light around for the auto-metering to work. These were taken with a tripod and some exposures were up to 2 seconds. Other shots were taken with my Canon flash unit. I didnt see the unloading of 2107 on the 17th of August 1997, but others did, their photos here. 2107 completes the current order for Variotrams for Sydney. 2102 - Thursday 5th June. The odd delivery order is due to 2101 suffering a road accident on the 30th of April that saw its trailer wrecked and the tram plowed into trees. The tram was taken back to Adtranz (in pieces) and rebuilt. 2102 was apparently involved in testing at Adtranz, leaving 2103 being the next unit available for shipping. (After a new carrier was manufactured).